墨爾本台灣商會: 2013 TAIWAN FESTIVAL - THIS SUNDAY! 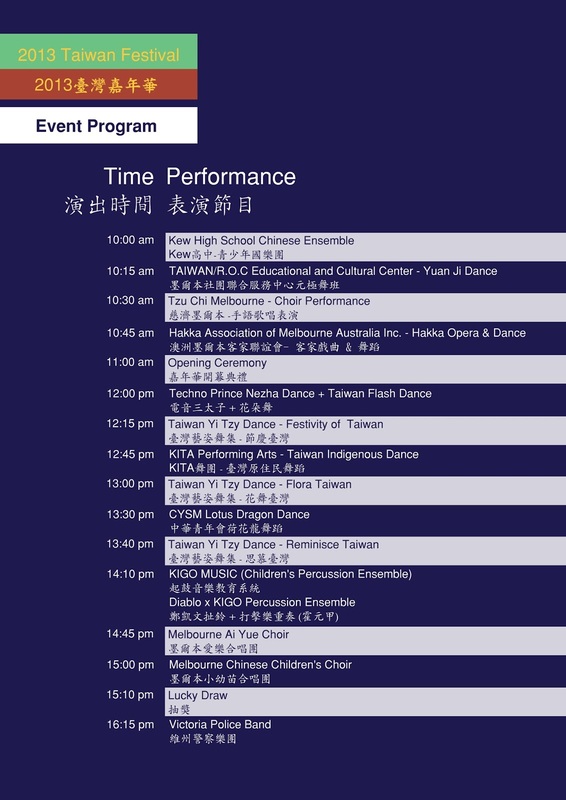 2013 TAIWAN FESTIVAL - THIS SUNDAY! Make sure you don't miss out on this wonderful multicultural celebration! Join us at this free event and immerse yourself in Taiwanese-Australia culture. This Festival will showcase the very best of Taiwanese culture, arts, entertainment and delectable cuisines, so do come along and fully experience the Taiwanese community spirit! This event is organised by the 2013 Taiwan Festival Committee, with support from the Melbourne Taiwanese Chamber of Commerce, Taipei Economic & Cultural Office (Melbourne), Federation Square, Delta Energy Systems (Australia), Yang Ming Group, Synnex Australia, AXF Group and many more!